We receive quite a few questions regarding the upcoming release of Apple’s iOS8, so we thought it’d be good to shed some light on this hot topic in our Blog. 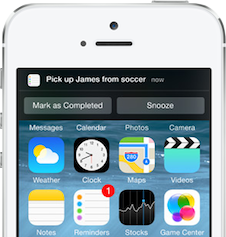 Below you can find answers to the most frequently asked questions about push notifications in iOS8. **Q:**My application which is now in the App Store was built with iOS7 SDK, will it be able to receive push notifications on devices upgraded to iOS8? A: The short answer is YES! You are absolutely safe on this one, because iOS8 supports all applications built with iOS7 SDK, and it will continue working fine with no changes required. **Q:**I want to publish my app for iOS8, what are the necessary steps regarding Pushwoosh SDK? A: If you are publishing your application for iOS8 specifically, you have to update your app with the latest Pushwoosh iOS SDK, which is currently in beta, and is available upon request. We will release the SDK publicly as soon as iOS8 Gold Master is released. **Q:**I’ve heard that iOS8 has the so-called interactive mechanism for push notifications, how can I utilize it in my app? A: Right, iOS8 gives your users an ability to interact with the application right from the push. Our developers are currently working on supporting all the new functionality that comes along with iOS8, and we are about to complete everything very soon. Please follow our Twitter, Facebook and Pushwoosh Blog for updates on iOS8 functionality, and other cool features we are about to release soon!